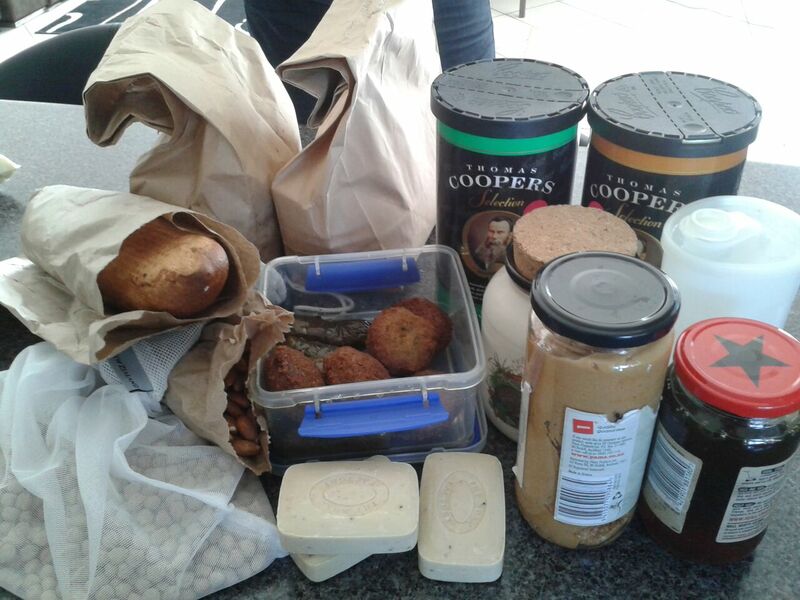 Some of the goodies from our day in Howick: Left to Right: In the brown paper bags kitty litter and flour, brew kits, baguette, almonds, falafel and dolmah in the container, op shop jar, vinegar, chickpeas, soap, peanut butter and honey. On Saturday the BF & I went to Howick Village Markets- what a lovely little market this is! They had fresh produce and vegetable plants and seedlings, honey, bakeries, soaps and crafts. I bought some bread which they packaged in a paper bag (but I have since sewn my own cloth bag out of an old pillow case) and some falafel and dolmah which the seller happily put in my container. Bin Inn was fantastic! It stocks plenty of legumes, baking ingredients, spices, lollies, pet food, and laundry and cleaning products- all in bulk! We also got some (beer) brew kits- alas they have a plastic lid though. I was also excited to find a machine which makes peanut butter (100% peanuts) at the press of a button! And it was way cheaper than buying from the supermarket. I have made peanut butter in the past but it was a bit time consuming as we don’t have a food processor only a Magic Bullet (not mine). The cashier was very helpful and weighed our jars for us. I used mesh produce bags and old ziplock bags which we have been reusing – we have since sewn a bunch of cloth bags out of old bandannas, pillow cases, pants and various other disused fabrics. The only things I did not find at Bin Inn was pasta, bulk tea (which I can get from Khyber Spice Royal Oak), and bulk shampoo for my flatmate. I was impressed they also have Eco Store in bulk, so I will start buying our household dishwash liquid from here! 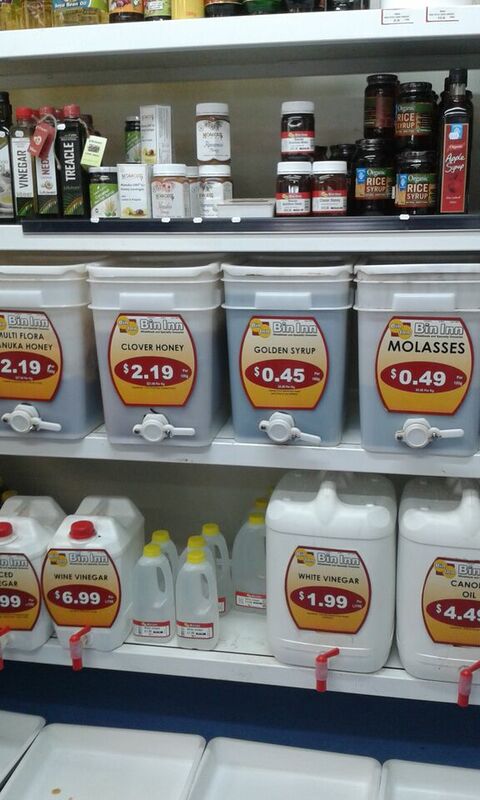 Bulk honey and syrups and various vinegar’s. Shopping in this way has been great- it involves interacting with staff, it gives me reasons to explore new suburbs and places, is cheaper and of course I am reusing my “packaging” and saving on rubbish. The only plastic we came home with was two pieces of tape and a small swing tag from my op shop purchases. While in Howick I spotted a poster in the window of bookshop from the latest New Zealand Geographic, which I found very fitting. The couple in the article did a Rubbish Free Year back in 2009, I remember reading about it each week in the Herald- it was truly inspiring for teenage me. 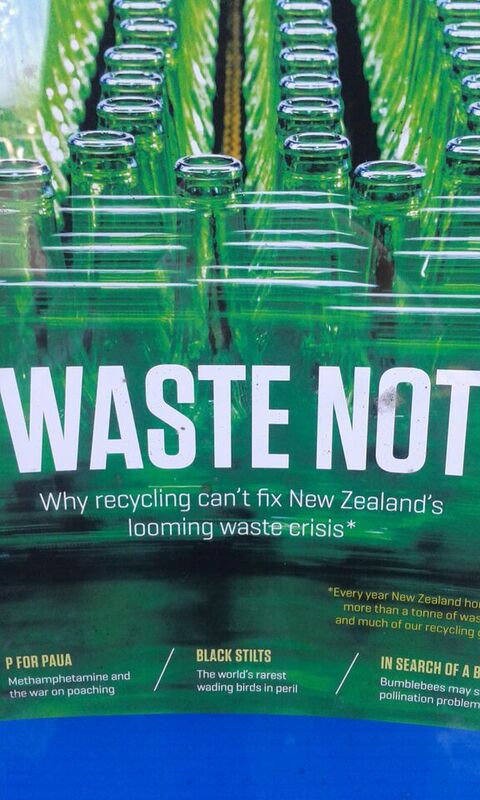 Their website is http://www.rubbishfree.co.nz/.